I’m reviewing this book thanks to reader Aaron G., who emailed me a recommendation for it on Friday. I got the email and was certainly intrigued by the book, so I figured I’d order a copy from Amazon or talk to the ILL librarians to see if they could snag a copy. It turned out, however, that there was an available Kindle version, so I just up and decided to grab it and do it this week, seeing as how I hadn’t picked another book yet anyway. I’m really growing to enjoy reading Kindle versions when it comes time to review a book. Gods, there’s just so much convenience there. I still prefer a physical book in a lot of ways, mainly because a physical book is a made thing with all sorts of bits and pieces beyond the text, choices like font and margins and formatting and stuff of that nature that gets lost when the book is digitized. Even the cheapest of the cheap paperback (probably) has reasons for those kinds of decisions, and I like to be able to look at those and think about them, even if the only reason for any given thing is saving a couple cents here and there. Still, nothing beats the convenience of a book carried around on my phone that lets me highlight and annotate. Sometimes I really love the future. I nabbed the cover of the book from isfdb.org, and I made the conscious choice to use the original 1974 cover from Curtis Books. I did this because, well, the Kindle version had a pretty bad cover and I didn’t like it. You can see it here. This author. Holy crap, folks, I am floored here. Eando Binder is the pen name of Otto Binder. He shared it with his brother, Earl, hence E-and-O. By the time this book came out Otto was doing all the writing and Earl was his literary agent, so I’m going to refer to the author as Otto henceforth. There are a lot more but those were the ones I recognized while I read his Wikipedia page. Binder was also a proponent of “Ancient Astronauts” stuff and wrote a few books on the subject, one of which had a forward by Erich von Däniken. I can’t find anything that says he was also a fan of Hollow Earth Theory, but considering the book I just read, I wouldn’t be surprised if he was. This book had one of the most bonkers premises I’ve read, and I thoroughly enjoyed it. It starts off just after Earth has been invaded by Martians. We’re told early on that the aliens aren’t really Martians, they just came to Earth via Mars from some unknown star. Whatever their origin, their motives are clear: They want to wipe humanity off the face of the Earth. Without warning, they just start exterminating us. Humanity’s best defenses are useless. All is doomed. In the meantime, a scientist named Dr. Aronson is exploring deep within the Earth. We know this because two of his protégés, Sergeant Evan Paige and “Sparky” Donovan, are still on the surface of the Earth and having to deal with these nutty Martians. 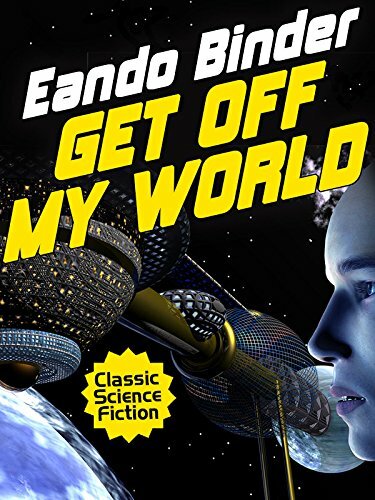 At the very start of the book, they fear that Dr. Aronson has been lost in his explorations, but they receive a message from him stating that he has reached THE CENTER OF THE EARTH. Dr. Aronson believes in a hollow Earth, and he also believes that Mammoth Cave in Kentucky has an entrance to the vast caverns below the surface. It turns out he’s right, and these caverns are inhabited. Paige and Sparky head down to find him, figuring that perhaps these subterranean people can help fight off the Martians. They head into Mammoth Cave, following Dr. Aronson’s trail, and are almost killed when they reach an scorching hot area with magma flows. They are rescued, however, by a guy named Tal Rithor and the only woman in the book, Reena Meloth (exotically beautiful). These folks are albinos and they take our heroes further down to meet all the other albinos. On the way they learn a bit of each other’s languages. Have you ever noticed how often the heroes of a speculative fiction novel happen to have a gift for languages? One that’s called out specifically? If the human protagonist doesn’t, then it turns out the aliens (space or human or otherwise) do. Often enough it’s because the alien species itself has a knack for languages. This frequently strikes me as altogether too convenient, although I guess it has to happen for the story to progress smoothly. 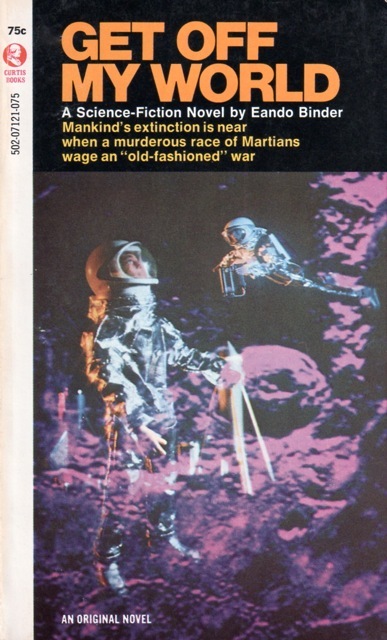 Still, I refer you to an early classic of the genre, Stanley Weinbaum’s 1934 story “A Martian Odyssey,” where the human never quite learns how to speak to the alien in the story, and it’s great. Anyway, Paige and Sparky go down and meet some other subterranean albino people, who, it turns out, are at war with another group of subterranean albino people. They have bigger things to worry about than whether the surface of the planet is being overrun with Martians, and moreover they don’t believe that it is anyway, because there’s no such thing as a surface. The entire universe is made of rock, they believe, and our heroes obviously just come from another cavern system and/or are insane. Dr. Aronson himself is deeper in the caverns, at the exact center of the Earth, in fact. Paige and Sparky want to go meet him, but are denied. The center of the Earth is a huge hospital, and Dr. Aronson is there helping the war wounded. Our heroes are instead conscripted to fight in the war. They get into their first skirmish and witness firsthand how awesome some weapons are, weapons that will no doubt make short work of the Martians. In an effort to finally meet their mentor, they shoot each other in the shoulder and are taken to the center of the planet. The trio tries hard to convince other people that there is a superterranean (I’m sad to see I didn’t invent that word) world, but fails miserably. They are eventually pronounced insane and put in an asylum, but they manage to escape because they are so awesome. The sequence itself is pretty great. The cave is, of course, the surface of the planet. Once there, we learn firsthand that the subterranean weapons do, in fact, make short work of the Martians, and things are looking up. Paige figures he can get a full-scale army up here and help wipe the Martians off the face of the planet, dealing with King Luth’s people later. Things start to go badly, though, when it turns out that Sparky and Dr. Aronson had a similar idea and led up an army of the other guys to the surface. Thinking that this is some kind of treachery, the two armies turn to face each other. It’s Sparky, usually the guy going “I don’t get it” for most of the book, who has a brilliant idea. He flees the scene and leads some Martians back, who attack the two armies. A Martian craft lands and one of the aliens steps out. This is the first time in the novel we get any kind of description of these aliens, and they’re pretty stock. Big heads, fangs, generally ill-meaning. The two armies put aside their differences, figuring that it’s their duty to help the surface people fight against the aliens. The book ends here, with renewed hope. All told, I liked the heck out of this book. It’s a mighty stroke of imagination to put together two classic sf tropes―a hollow Earth and an alien invasion―and make them work together. I was generally quite pleased with how it turned out. We learn at some point that the subterranean humans didn’t originate down there. We’re told some of their legends, and in a very Twilight Zone kind of way we find out that there was once a great city named something like “Atl-aahnt-us” and sank beneath the waves and eventually beneath the surface. I think that Mu was also involved and also sank beneath the Earth. I guess that’s the origin of the two fighting factions, but I don’t think that was ever explicitly stated. The whole book is founded on all these crazy pseudoscientific concepts and it’s just great. We get space aliens, Atlantis, Hollow Earth, and stuff about how radioactivity is also gravity for some reason. The book genuinely felt like it belonged to an earlier era of the genre. ’71 seems a little late for this pulpy kind of adventure that didn’t have much in the way of a message or anything like that. It was pure entertainment. If I hadn’t seen the publication date, I would likely have thought that the book was written sometime in the fifties. In fact, even though I can’t find any evidence of it, I’d bet that there was a shorter version of the story put out for one of the pulp mags at some point. Don’t take that as gospel, though, because I’m just guessin’. I want to thank Aaron for bringing this book to my attention. I wonder how he was guessing I’d respond to it. All-in-all, I liked it and enjoyed it, although it had some major storytelling flaws that slowed down the action considerably. In a way, it makes a lot of sense that Binder also wrote for comics in an era where the action was often described as it happened in dialogue, because that’s what this felt like a lot of the time. I’m glad I got to read this. Since you don’t mention it, I have to ask if you are aware of the1939 short story “I, Robot” by Eando Binder, which influenced Asimov. I saw a few mentions of it when I was researching, but didn’t know anything else. I’ve heard that Asimov didn’t intend for his stories to bear that same name and that the publisher went against his wishes, but that’s about it. It’s fairly famous on its own, with multiple TV/film versions. Wikipedia under “I,Robot (short story)” — to avoid getting Asimov by accident — is brief and clear. Gotta say, Pellucidar Versus The Martians is such a bonkers great idea I’m surprised it hasn’t been done more. It’s almost got the ring of one of those modern Doctor Who stories that seem to be originated by a Mad Lib (“Dinosaur spaceship! Victorians on Mars! Space Titanic!”) that are at least interesting right up to the point they stop making sense. I love e-books, but this one is a major argument for getting the paperback. It’s another of Curtis Books photo covers with G.I. Joe in his Mercury Astronaut spacesuit! It’s not as cool as the cover to “Puzzle of the Space Pyramids” by the same author, but few things are.